The number of new cars sold in the UK in 2008 fell by 11.3% from 2007 to 2,131,795, according to the Society of Motor Manufacturers and Traders (SMMT). The annual figure was the lowest since 1996, following eight consecutive monthly falls. Sales fell 21.2% in December, compared with the same month the previous year, to 108,691 vehicles. That figure is still a big improvement on November, when sales fell by 36.8%, which was the biggest drop since 1980. 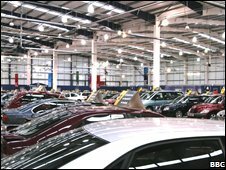 The SMMT called on the government to support the car industry. "The extraordinary circumstances we currently face mean that government support will be required to take advantage of global economic growth when it returns," said SMMT chief executive, Paul Everitt. But it conceded that the cut in VAT on 1 December might have contributed to the fall in sales slowing from November to December. The Ford Focus was the best-selling car in 2008 for the 10th consecutive year and was the only marque to sell more than 100,000 vehicles during the year. The new Ford Fiesta was the top seller in December.